My cousin Denny's daughter Kerra called me today to get an address for an invitation to a reunion. Having sent a flowering tree for them to plant in her mother's memory, I had checked the tracking for its delivery. I knew it left Lansing early today so I alerted Kerra to its imminent arrival. Seconds later, at 2:06 pm to be precise, she said a FedEx truck had left their driveway and they must have left the tree at the door! 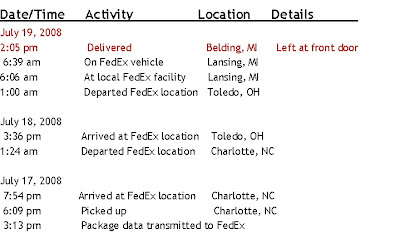 Instinctively, I clicked on the tracking number link in my confirmation email and there it was, clear as day, "2:05 pm, delivered, Belding, MI, Left at front door"!! Now THAT'S service!